At our house, chicken corn curry night always starts with rotisserie chicken from Costco. If we eat rotisserie chicken for dinner one night (we had Game 3 Salsa with chicken tacos over the weekend), everyone knows that chicken corn curry night is in the near future. As I mentioned before, I love Costco rotisserie chicken because it’s tasty, cost-effective, and most importantly – it’s convenient! It also freezes well, especially if you FoodSave. For chicken curry, I like to use the leftover carcass, a leg, the wings and some breast meat. This dish is one of our regular family meals because it’s easy to prepare, everyone loves it, and there’s plenty of leftovers for a second curry night (which is good for me some weeks when life gets busy). I’m sure these are the same reasons why my mom made curry regularly for us when I was growing up. My mom usually made beef curry for us since we preferred this over chicken, and she used either stew meat or thin shabu-shabu meat. When she did make chicken curry, however, she would use cubed chicken breast and for some reason I never grew to love this. I think this is why I like using rotisserie chicken because the meat shreds into very tender pieces while it cooks, and it doesn’t need to cook for that long. In a large stock pot, bring 8 cups of water to boil. Add rotisserie chicken carcass, wings, breast and leg to the pot. I remove the skin prior to boiling the chicken. I I have a large pot with steamer so I put the chicken in the steamer so that it’s easier to separate the bones and cartilage from the meat. 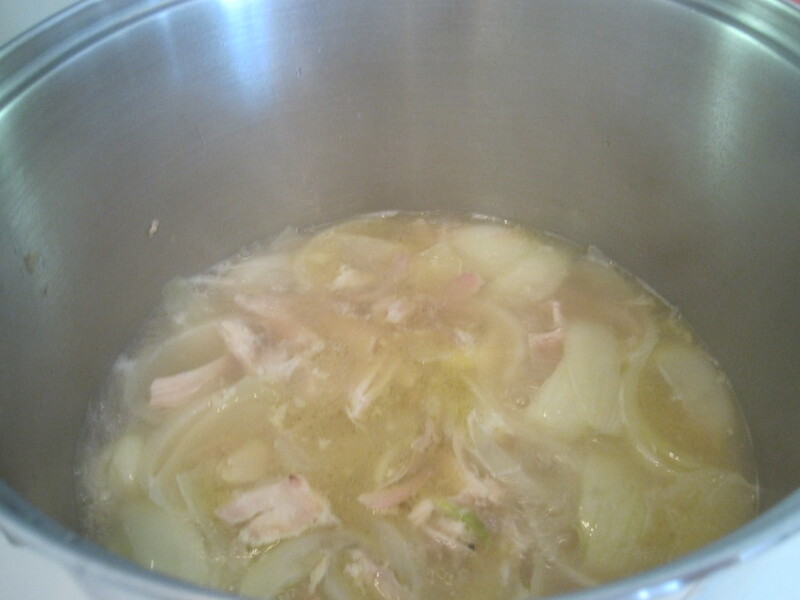 Reduce heat to medium-low and simmer for 45 minutes. Add rough chopped garlic to the pot. This really builds flavor into the stock and makes the curry really tasty! Remove the steamer and separate the carcass, bones and cartilage from the meat. Return the meat back to the pot and increase heat to medium-high. Add rough chopped onions and garlic to the pot and allow this to cook for 15 minutes. 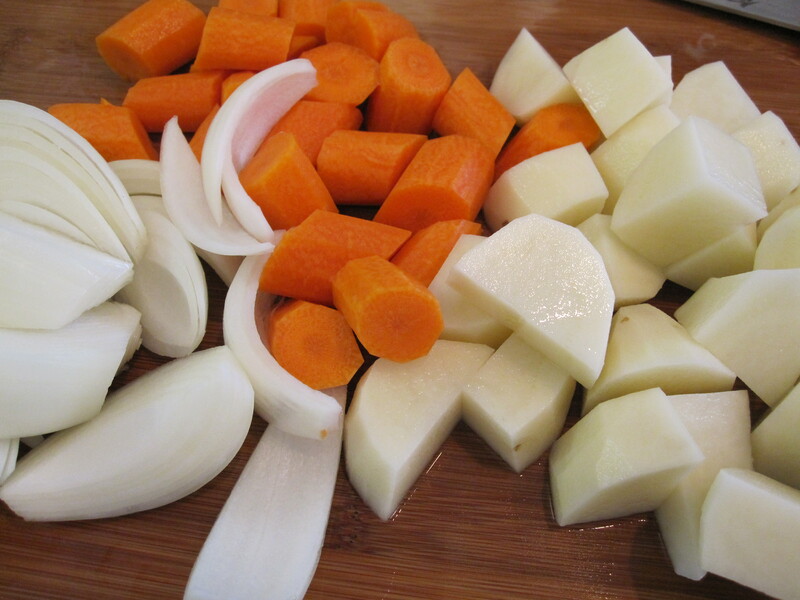 Add rough chopped carrots and potatoes to the pot. I chop up the curry into smaller pieces so that it dissolves quickly and evenly in the pot. I watched my mom do this countless times when she made curry when I was little. Add the cubes to the pot and stir gently until they dissolve and the curry is smooth and creamy. Next, I add my mom’s secret ingredient… which is no longer a secret thanks to my blog, but that’s OK I’m sure she’s happy to spread the love. Add 2 tablespoons milk – low-fat, skim, regular – whatever you have. As a kid, I once caught my mom pouring milk into the curry pot straight out of the carton and I asked her, “WHAT are you doing THAT for?!?!! I don’t want milk in my curry!” She just smiled and said it makes it creamier and that I never complained about it before. Hmmm. Ok, she did have a point there. Next, add 1 cup canned corn. I found that this was the perfect amount without being overwhelmed by too much corn. If you love corn, by all means feel free to add the whole can. Bebe dada and big onechan LOVE corn, but I don’t love canned corn THAT much, so in all honesty, the 1 cup is really perfect for my taste. :) I usually save the leftover corn and for salad or another dish. If you’ve ever eaten at a curry restaurant in Japan, you’ll find in their display window beautiful plates of curry with a variety of toppings, and one of them might be a fried egg – made with plastic of course AND hopefully not dusty! After all these years, I still haven’t figured out why the Japanese like to see their food plasticized before they eat. Someone once told me it’s because the Japanese like to see what they are going to eat. Does plasticized food do justice to the real thing… and what if it hasn’t been dusted in awhile? I’ve definitely seen that before, and it’s not pretty. Anyway, getting back to the egg. Sometime in college, my parents started topping curry with a fried egg, and this had to be over-easy so the yolk would ooze out over the curry. Yum! 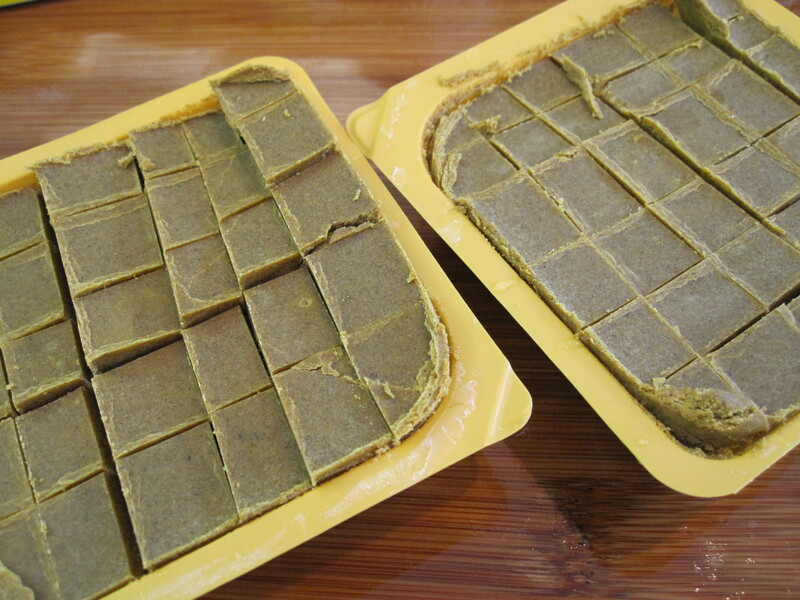 :) I think we were influenced by our very close family friends, the “Tree Villagers” who introduced this to us. Now and then, I’ll make myself an over-easy egg to top my curry. It’s one of those things that I can go without for a while, but then I crave it because it’s nostalgic. This entry was posted in Chicken, Family Favorites, Japanese Cuisine Favorites, Nene's Favorites and tagged Chicken Curry, Japanese Curry, Japanese Food by Judy | Bebe Love Okazu. Bookmark the permalink. I’ll have to try the fried egg topping! LOL Never had it like that before. I decided to pass this award to you because your blog enrich my daily life all the time and I really enjoy your blog. Judy, this looks delish! 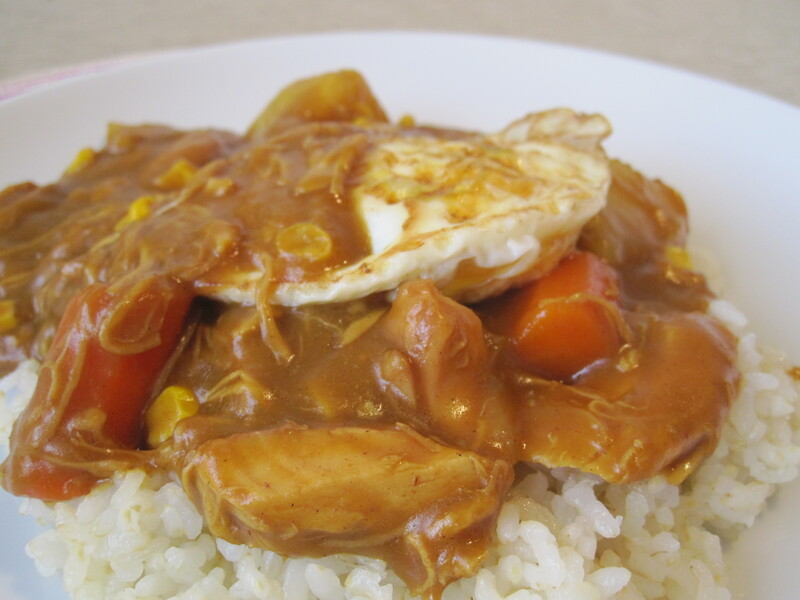 I’ve made curry plenty of times, but not with corn, an egg on top, and using Costco chicken! 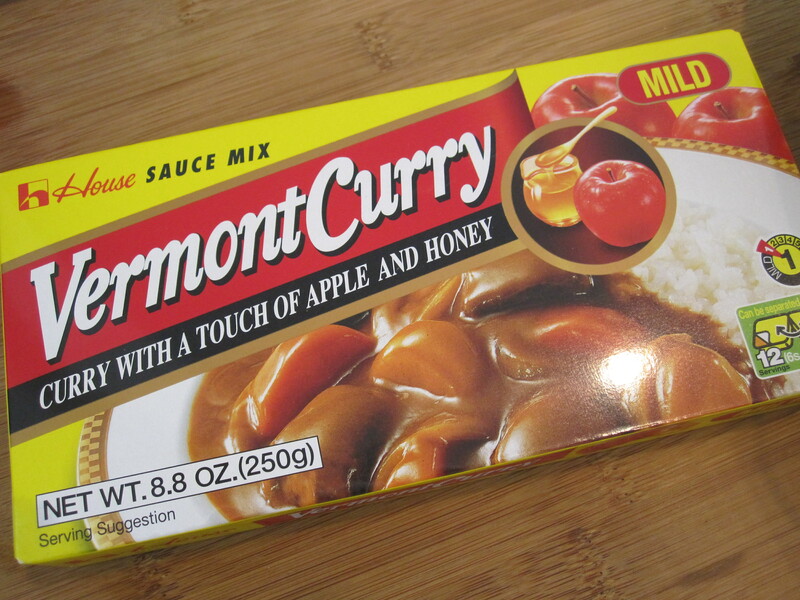 (and the Vermont brand of curry–usually I use the Japanese kind). Definitely will try this version! Oh and I liked your blueberry cheese cup recipe too! Oh my gosh — this looks SO good. It brings me back. I never ate curry as a child and then started to eat it regularly when I was an exchange student in Japan, where it was the cheapest thing to order in the cafeteria. Natsukashii!! 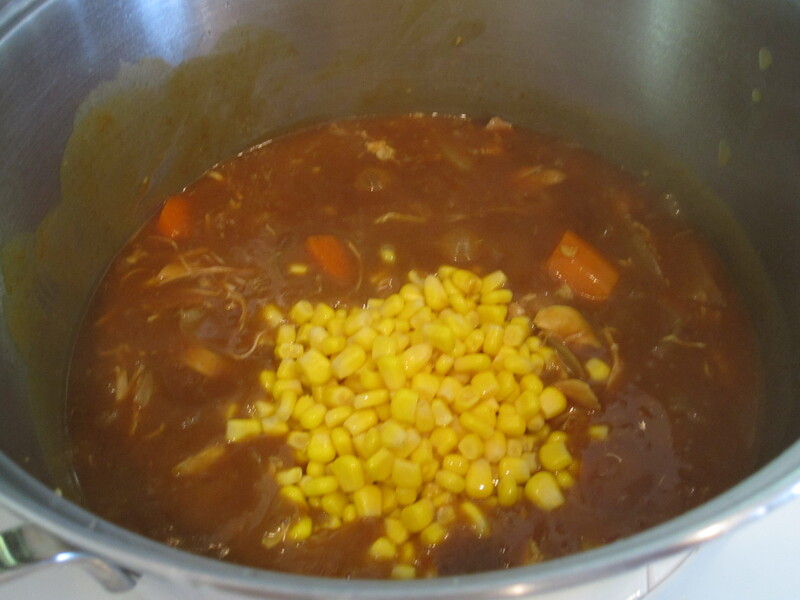 What a great idea using the milk and the chicken and corn — thanks for sharing this recipe! Thanks, Melissa! Wow, in college I thought about being an exchange student in Japan but I never did it and feel I missed out. Cheap cafeteria food sounds like good times! :) Heard about your ankle – hope you’re feeling better and it heals quickly!